NRDC-ITA is a multinational Headquarters based in Solbiate Olona, in the Varese area, close to Milan. Italy is the framework nation providing approximately 70% of personnel, while 30% remaining is made up of Officers, Non-Commissioned Officers and Soldiers coming from the other contributing nations. The multinational environment is the key factor that enables NRDC-ITA to operate successfully, including highly skilled military personnel coming from 18 contributing nations: Albania, Bulgaria, Canada, France, Germany, Greece, Hungary, Italy, Latvia, Lithuania, the Netherlands, Poland, Romania, Slovenia, Spain, Turkey, the United Kingdom and the United States of America. In 2001, on the parameters of a new structure, NATO decided to provide the Alliance with rapid deployable, mobile, sustainable and flexible multinational forces and related command and control capabilities. In compliance with NATO’s requirements, the Italian Ministry of Defence established the NATO Rapid Deployable Corps - Italy. In 2015, NRDC-ITA moved from operating solely at the tactical level to the operational level, being validated as a Joint HQ so adding an additional capability to the already standing Land Component Command and Corps structure and procedures. The presence of staff from the Navy and the Air Force and related coordination cells, ensures the joint capability of NRDC-ITA. Additionally, the Headquarters is able to plan and execute high-intensity military operations as well as Crisis Response Operations, cooperating with a large number of non-military actors/entities fully implementing NATO Comprehensive Approach concept. The Support Brigade is the Support Unit of the HQ. It provides command support, allowing COMNRDC-ITA and his staff to exercise command and control over the assigned divisions and Corps troops. 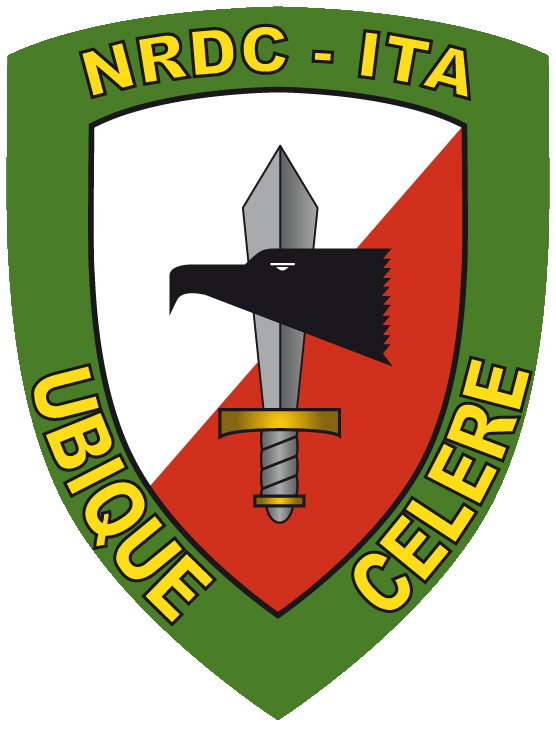 The Support Brigade consists of the 1st Signal Regiment based in Milan, a Tactical and Logistic Support Regiment and the Post HQ based in Solbiate Olona. Command support includes the provision of communication and financial support, the transport and building up of the NRDC’s deployable command posts (CPs), the establishment of a combined radio and satellite communication network. The Support Brigade's main task is to guarantee the Corps staff life support as in peacetime and on operation. The 1st Signal Regiment is based in the “SANTA BARBARA” Barracks in Milan and it is articulated in two Signal Battalions the “SPLUGA” and the “SEMPIONE”. The Regiment provides NRDC – ITA HQ with C4 support both in peace time and operations. In order to fulfil this task, the “SEMPIONE” Battalion is full-time committed to the provision of Communication and Information System support at Rear Alternate Step up (RAS)/Rear Support Command (RSC) CPs, while the “SPLUGA” Battalion covers the CIS requirements of NRDC-ITA HQ Main CP. The Regiment was already deployed in operations for C4 support in 1997 to the Multinational Protection Force (MPF) Command in Albania and in 1999-2001 in Kosovo and Bosnia. The Regiment has the specific task of providing life support to the HQ NRDC – ITA and the Signal Brigade Command both in peace and on operation. The main tasks assigned to the Regiment are: to guarantee the support in terms of Real Life and to assure all CPs’ defence, management and logistic support. The Regiment also based in “UGO MARA” Barracks is composed of a broad typology of coys able to cope with the different aspects of “life support”. The Regiment task organization is based on 5 Companies: Transport, Commissariat, Rifle, Engineers and Command and Logistic Support. The Regiment has a wide spectrum of equipment: vehicles, including heavy transport vehicles, tankers, motorcycles and mechanical handling equipment. The Supply Company plays a fundamental role as it is equipped with shelters for different purposes, such as bakery, laundry, kitchen, showers and toilettes. This makes it capable of satisfying 380 people per hour in terms of Real Life support.